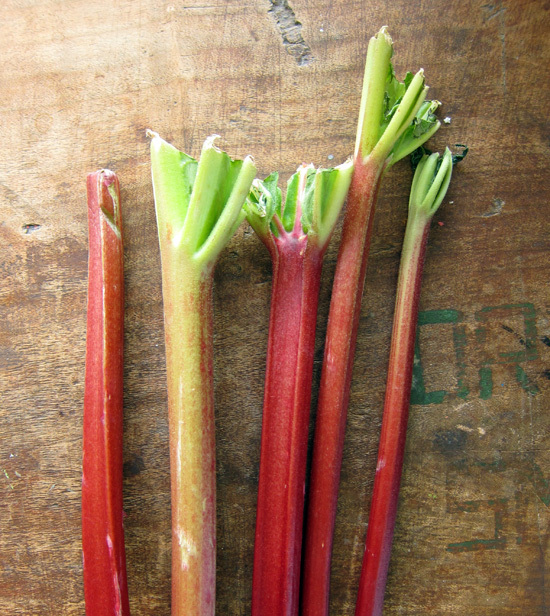 Spring and rhubarb go hand in hand and because I love rhubarb so much, almost every time I head to the market, I come back with a few stalks. I just can't help myself. Rhubarb, stop being so gorgeous! So what was I going to make with these beauties? Luckily, I had just dropped off some cards at Tiny Finery (a cute little shop in New Westminster, BC) and was talking to the owner, Stephanie, about rhubarb. She told me to look up Jamie Oliver's recipe for a rhubarb ginger crumble because it was the best she had ever had. Ginger was key, she said, as it almost candies itself into the rhubarb mixture. I was sold. Ginger + rhubarb. A match made in crumble heaven. I had all the ingredients ready to go. 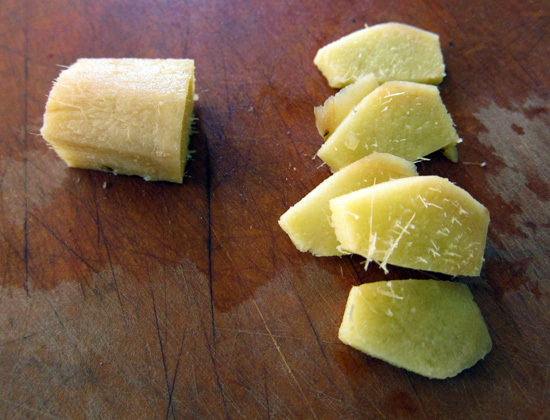 Plus, I also had some candied ginger on hand, so I banged that into the dish too. Yup, awesome move! 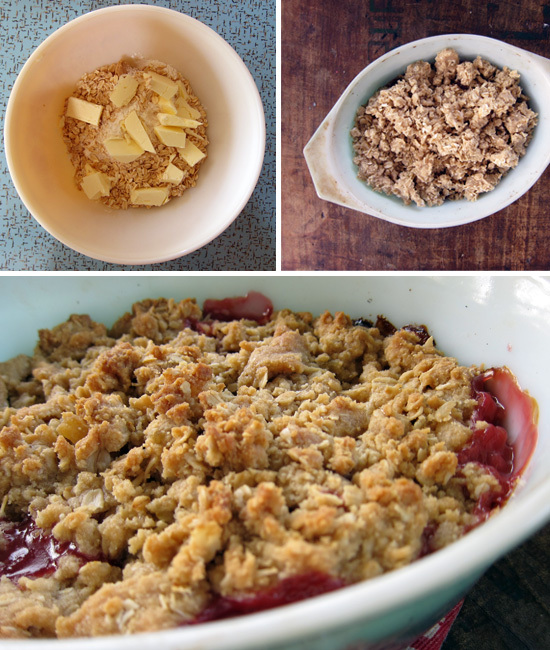 What I love about this dessert is that the ginger doesn't just end up stewed with the rhubarb, it's also a big component of the crumble. Double the ginger fun! And making the crumb portion couldn't be simpler. Once you've got your crumble dough together, make sure to make a few large crumbs by squeezing bits of dough together. Like the song says, I like big crumbs and I cannot lie. Or something like that. In a medium sized pot, add in rhubarb, half of the brown sugar, one tablespoon each of fresh ginger and candied ginger, along with the orange juice and zest. Put a lid on it and bring to the boil over medium-high heat. Turn down heat and simmer for a few minutes until the rhubarb has softened. Spoon the rhubarb compote into an oven proof dish (or several ramekins, if making individual portions). To make the crumble topping, add in the remaining brown sugar, the remaining ginger (both candied and fresh), the flour, oats, salt and butter. Use your fingers to blend the butter into the mixture to create crumbs. 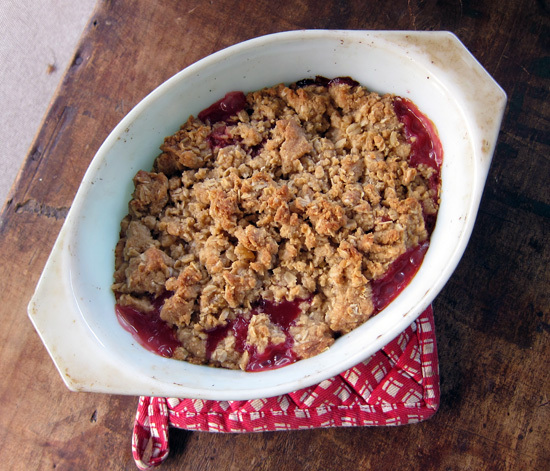 Dump the crumbs evenly over the rhubarb mixture and bake for 40 minutes or until the crumble is golden and bubbly. Cool slightly and serve with ice cream, whipping cream, custard or yogurt. It's also fine plain too. Yummo!! That looks so good! I need to give this a try! Oooh! this looks absolutely delicious and a must have to bake for me now, in fact I think there is still rhubarb in my mums garden. The title of your post made me smile...thinking of the song I'm sure you were thinking of! That crumble looks delicious. I LOVE rhubarb too. 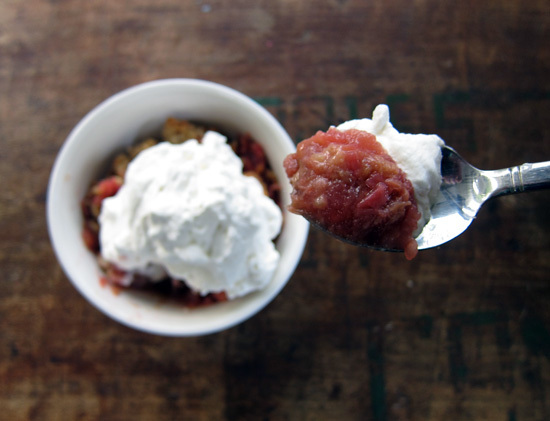 I've been making rhubarb compote ever since I saw the NY Times video by Melissa Clark. Just rhubarb and sugar. I keep it in the frig to top yogurt, oatmeal, pound cake or what ever. Crumble Yumble! Now I feel like I have to make this and soon - looks so delicious.. I have got to make this for my daughter -- she adores rhubarb but doesn't love the rhubarb custard pies her grandma made (which were awesome) b/c she dosn't love custard. THIS she will love! mmh, if you have rhubarb in your garden, choose first the early young stalks coming at springtime... that's the most tasty ones. i want this. right now. Made this tonight and it was perfect! Delicious. Thanks Jan, my version is in the oven now!